This is the third factoid in a series of four factoids showing the rise of E-Commerce in the Furniture Industry. The phenomenon of e-commerce has been the rise of what was once called “Non-Store Retailers”, now referred to as “E-Commerce Retailers” – companies without physical stores competing with brick and mortar establishments. Furniture and home furnishings through e-commerce retailers increased from $4 billion to $24.3 billion in ten years (2004 to 2014) – a growth of 503 percent. Along with furniture and home furnishings, other consumer merchandise lines dramatically increased sales through e-commerce retailers. 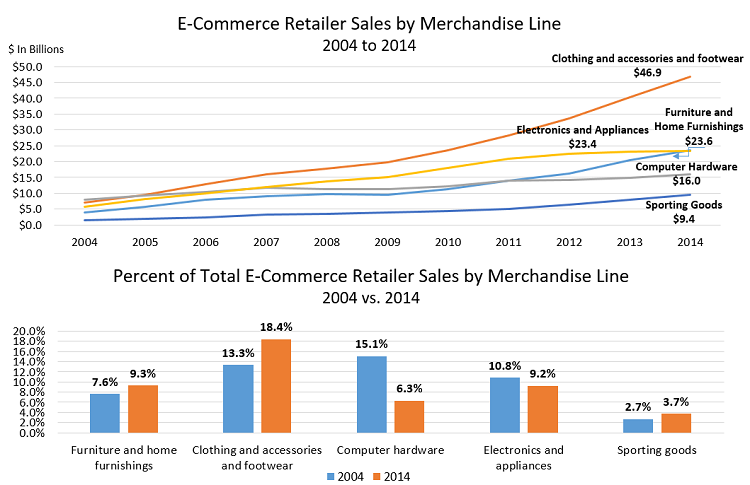 At $46.9 billion in sales, clothing/footwear leads e-commerce retailer sales in 2014 up from $7.1 billion in 2004. By far, the fastest growing products sold by e-commerce retailers, clothing/footwear increased 561 percent over the ten year period. 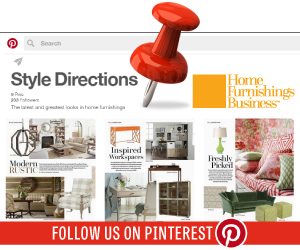 Furniture and home furnishings experienced the highest growth among e-commerce retailers coming out of the recession 2009 to 2014 – jumping an average of 20 percent per year. Sporting goods sold through e-commerce retailers also experienced high growth in the last few years, but electronics and computer hardware have tapered off with sales increasing a yearly average of five percent since 2011. Of the five selected merchandise lines, clothing/footwear holds the highest share of e-commerce retailer dollars and grew from 13.3 percent share in 2004 to 18.4 percent share in 2014. 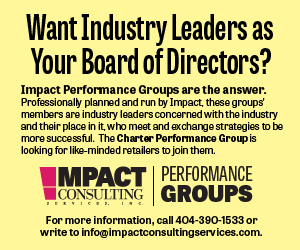 Furniture and home furnishings also saw a gain in share – finishing 2014 at 9.3 percent. As more merchandise lines like clothing and furniture have increased their internet presence, two broad product areas have lost share among e-commerce retailers -- electronics and appliances and computer hardware. Once the king of e-commerce, computer hardware fell from 15.1 percent share to 6.3 percent in ten years. Electronics and appliances slipped down from 10.8 percent share of e-commerce retailer sales to 9.2 percent. 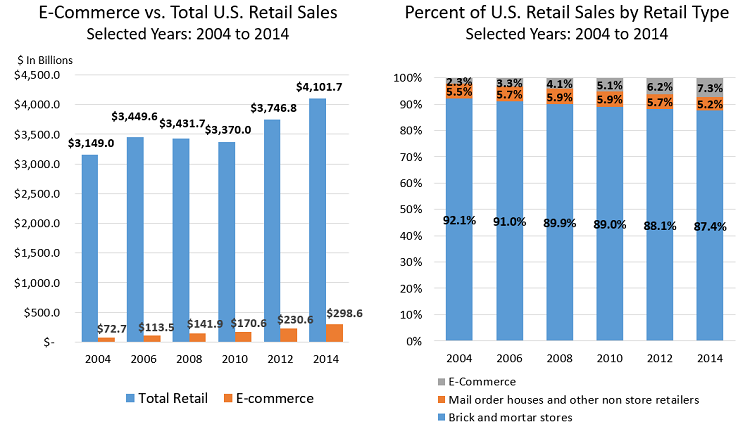 The next and final factoid of this series will compare e-commerce to total retail trade. This is the second factoid in a series of four factoids showing the rise of E-Commerce in the Furniture Industry. With the sophistication of the internet has come the booming growth of e-commerce. The combined furniture and home furnishings industry has been one of the big recipients of this growth second only to the clothing/footwear industry. It is estimated that 2015 internet sales of furniture alone now totals an estimated $14 billion or 15 percent of furniture industry sales. Comparing furniture and home furnishings stores to other retail brick and mortar companies, furniture and home furnishings stores lag behind in percent of e-commerce sales to total sales, though none are exceeding three percent of sales via e-commerce. This is the first factoid in a series of four factoids showing the rise of E-Commerce in the Furniture Industry. With the sophistication of the internet has come the booming growth of e-commerce. The combined furniture and home furnishings industry has been one of the big recipients of this growth second only to the clothing/footwear industry. It is estimated that 2015 internet sales of furniture alone now totals an estimated $14 billion or 15 percent of furniture industry sales. 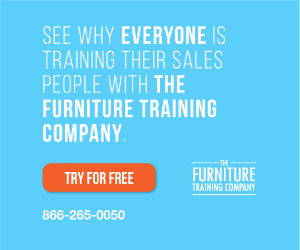 Since the bottom of the recession in 2009, total furniture industry sales have grown 24.1 percent, and much of that growth can be attributed to the rise in e-commerce. Actual brick and mortar store sales of furniture are up 13.8 percent since 2009 while e-commerce has grown by 168 percent. 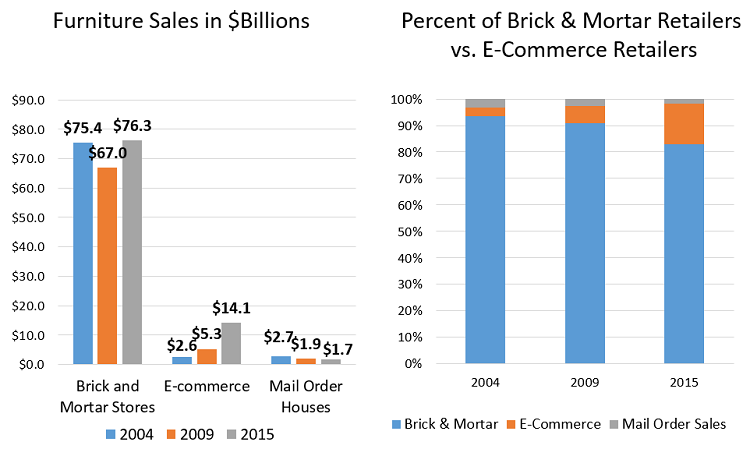 In 2004, e-commerce sales were inconsequential in relation to brick and mortar store sales which accounted for 93.4 percent of the total furniture industry. Over eleven years, the share of e-commerce has grown from 3.2 percent to 15.3 percent in 2015, while brick and mortar sales fell to 82.9 percent of total furniture dollars. Along with furniture e-commerce sales, other home furnishings products – floor covering, window treatments and home accessories – have grown at an even faster pace than furniture. While furniture e-commerce sales have grown 440 percent since 2004, home furnishings have growth 697 percent to $13.9 billion. 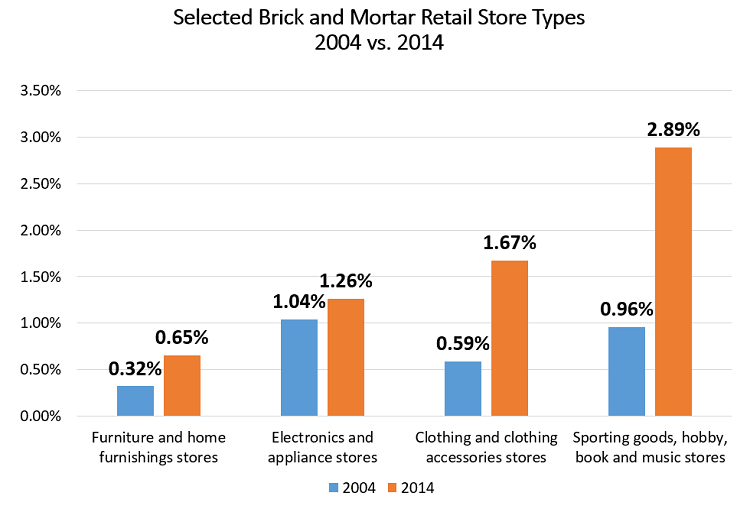 The next factoid in this series will take a closer look at brick and mortar stores e-commerce. This is the final factoid in a series of four factoids detailing Millennial home buying trends, shopping attitudes and habits and whether they lend themselves to home furnishings purchases in the future. Millennials, ages approximately 17 to 34, represent the largest generational cohort in history with numbers exceeding 83 million. This factoid explores through surveys and studies how Millennials shop and what guides their purchases. As the economy improves and Millennials grow their bank accounts, settle down, and become homeowners, how else will they spend their money? Forbes magazine conducted a study on the consumer characteristics of Millennials in 2015 and surveyed 1,300 young adults. A majority of Millennials are loyal to brands (60 percent) and want them to engage with them on social networks (62 percent). Seventy-five percent hate corporate greed and find it very important to give back to society, especially through local communities. Compared to fewer than three percent relying on TV news, magazines, or books, 33 percent of Millennials look to blogs for recommendations and design ideas. 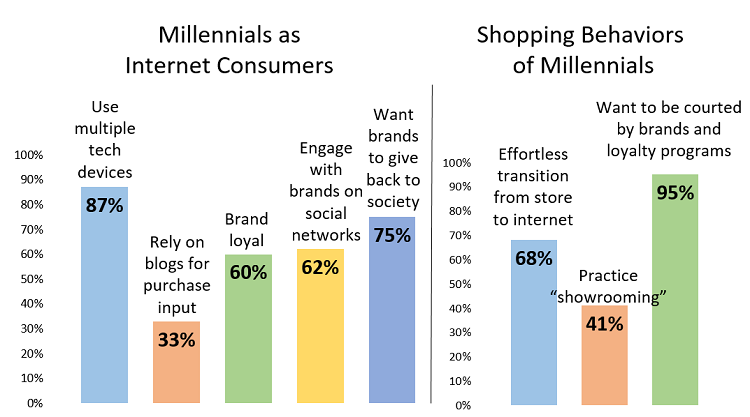 Just because Millennials are a digital generation does not mean they want to completely abandon traditional ways of shopping. Instead, they expect to have a streamlined experience between physical stores and the internet. According to a study conducted by Accenture on the shopping behaviors of Millennials, 68 percent of young adults demand an effortless transition from smartphone to personal computer to physical store when searching for the best products. Forty-one percent said they practice “showrooming” by checking out a product at a nearby retail store and then shop for it online to find the lowest price. Millennials love loyalty programs and 95 percent said they want brands to reach out to them by sending coupons via text, email or mailed to their homes. This is the second factoid in a series of four factoids detailing Millennial home buying trends, shopping attitudes and habits and whether they lend themselves to home furnishings purchases in the future. Millennials, ages approximately 17 to 34, represent the largest generational cohort in history with numbers exceeding 83 million. While the sheer size and education of this generation should lend itself to consumers pouring into prime furniture buying years, the negative results of the Great Recession and a delay in marriage has initially slowed down homeownership among Millennials. These first-time home buyers have been sitting out the housing recovery largely because of financial reasons. Along with staggering college debt, young adults are faced with a slow to increase median income. Millennials ages 25 to 34 earn $31,219 annually, down over 10 percent from a peak of $34,459 in 2007. 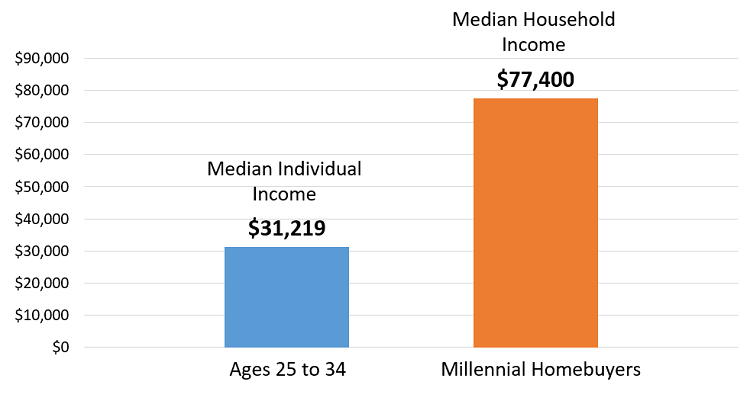 According to a recently released survey by the National Association of Realtors (NAR) of over 6,000 home buyers July 2014 to June 2015, Millennials purchasing homes have a median household income of $77,400 and take a median of four years to save for a down payment.